In Australia, we are lucky to have some of the most beautiful native flora in the world. Since 1816, these natural botanical wonders have found a home in the Botanic Gardens, established by Governor Lachlan Macquarie on the shores of Sydney Harbour on the very site where Governor Phillip set up his first farm in 1788. Now, this rich botanical history has been captured in Ashdene’s Floral Emblems of Australia range – a collection that is inspired by the majesty of the Australian landscape and our very unique natural plants and flowers. Taking images from the Public Botanical Library Archives in Sydney, each piece in the Floral Emblems range features a stunning full-colour botanical drawing of Australian flora, accompanied with its Latin and common names, as well as the region of Australia that the emblem represents. 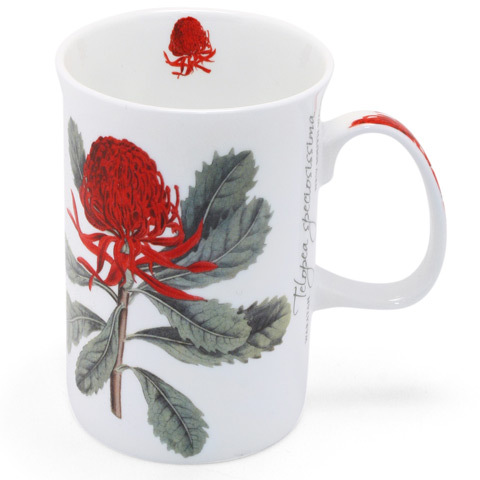 If you love the idea of sipping a cuppa in the midst of the Australian outback, then this Floral Emblems Mug is for you. Made from fine bone china, the mug features a beautiful floral image around the outside as well as a matching motif on the inner rim and handle. One sip and you’ll feel like you’re enjoying your own little taste of Australiana! Bring a little piece of Australian natural beauty to your home with Ashdene. Printed with a floral emblem design, along with the plant’s Latin and common names, and the region in which it grows. Features a matching floral print on the handle and the inner rim. Royalties from the Floral Emblems series go towards assisting the conservation efforts of the Botanic Gardens Trust. Design: Waratah - New South Wales.